Home » Debian , Gentoo , Gnome , Graphic Tools , KDE , Red Hat , Slackware , Utility » KDocker will help you dock any application into the system tray. 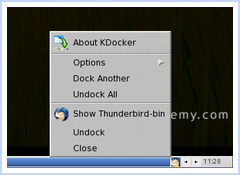 KDocker will help you dock any application into the system tray. This means you can dock openoffice, xmms, firefox, thunderbird, anything! Just point and click. Works for all NET WM compliant window managers - that includes KDE, GNOME, Xfce, Fluxbox and many more. Please note that the contributed version is not always the latest released version. Please contact contributors directly if you face any problems.